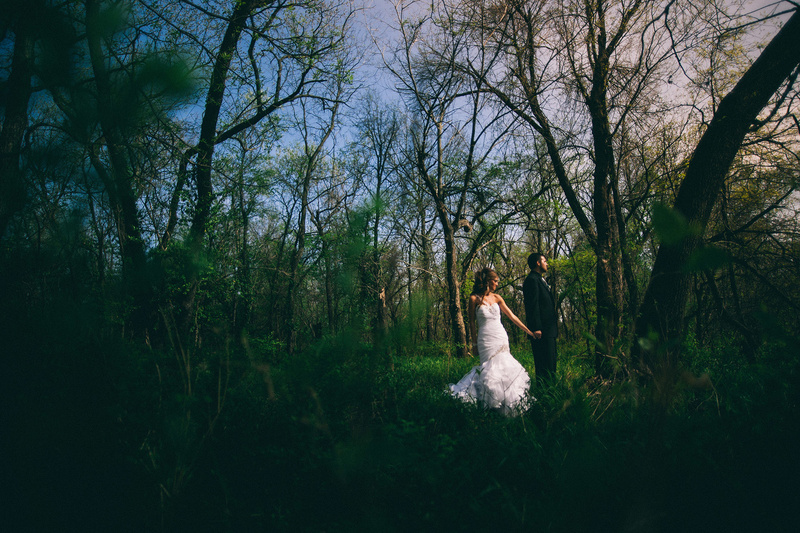 Throughout the wedding day, I'll switch between several lenses, but the first time I break out my wide-angle lens is during portraits with the bride and groom. When most people think portraits, they think tight and up close and personal in order to fill the frame. These are great and should always be a part of what you deliver to a client, however sometimes you need to be able to get a sense of the scene for a good environmental portrait. If you are using a lens similar to an 85mm, you have the ability to step back and include your entire scene. The problem with this situation is that it can lead to your subject being too small in the frame. 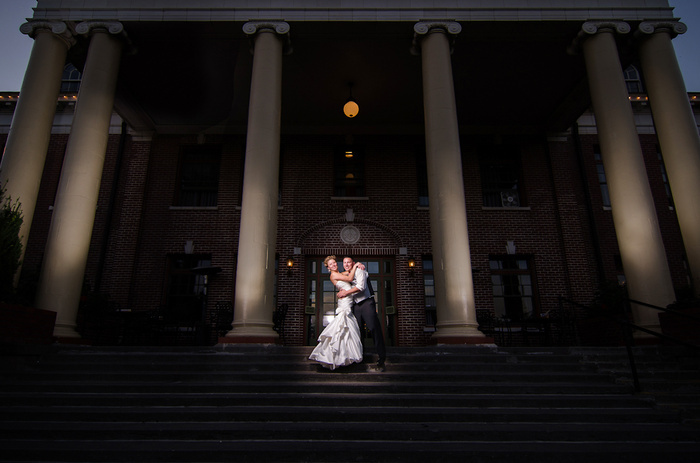 After taking the photo above I knew I loved the location and the setup, but I wanted there to be more focus on the couple. 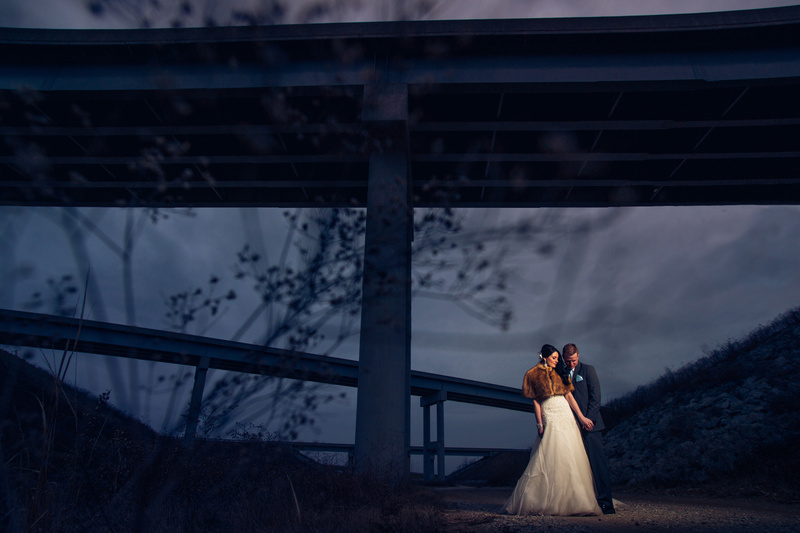 With a 20mm lens I knew I could make the couple more predominant in the frame while still including the bridges that originally drew me to this location. This is a great example because the couple is standing in the exact same location as the first image, however both images are significantly different. By changing your focal length and shooting position, you can give a completely different look to an image without moving your subject or lighting. This also gives a good example to how the compression comes into play when dealing with different focal lengths. 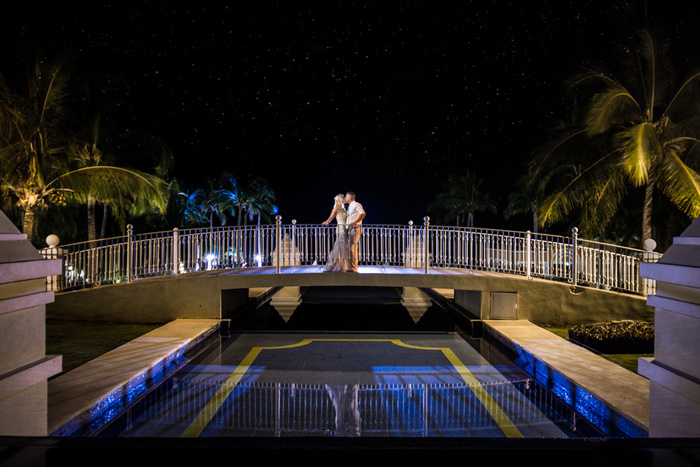 In the image shot at 20mm the bridges seem more spread out and further away from the couple. 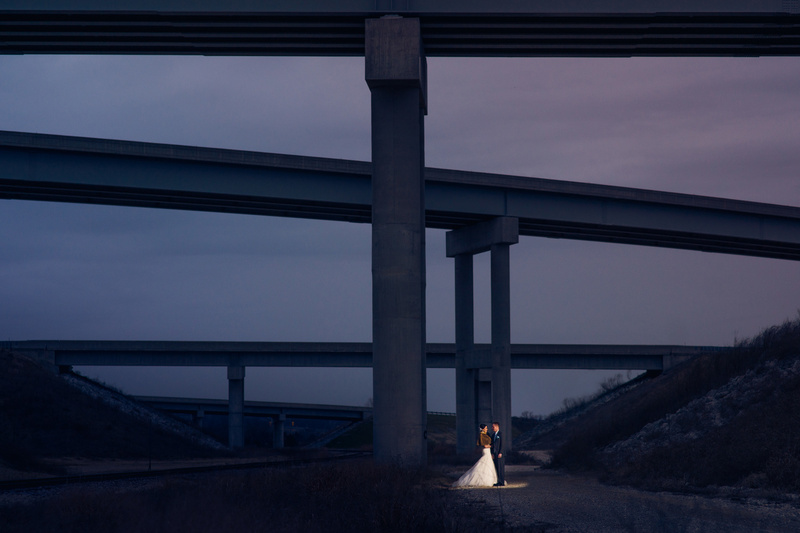 For the image taken at 85mm, the bridges are more compressed and seem closer to the couple. I also love to take dramatic-style images that include a significant amount of sky. When shooting a wide-angle lens I’m almost always shooting up and my subject is usually in the lower half of the frame. I feel like this gives the viewer a sense of awe, since they are looking up to the couple. One of the benefits of utilizing a wide-angle lens is that even when shooting wide open you are able to capture basically everything in focus. 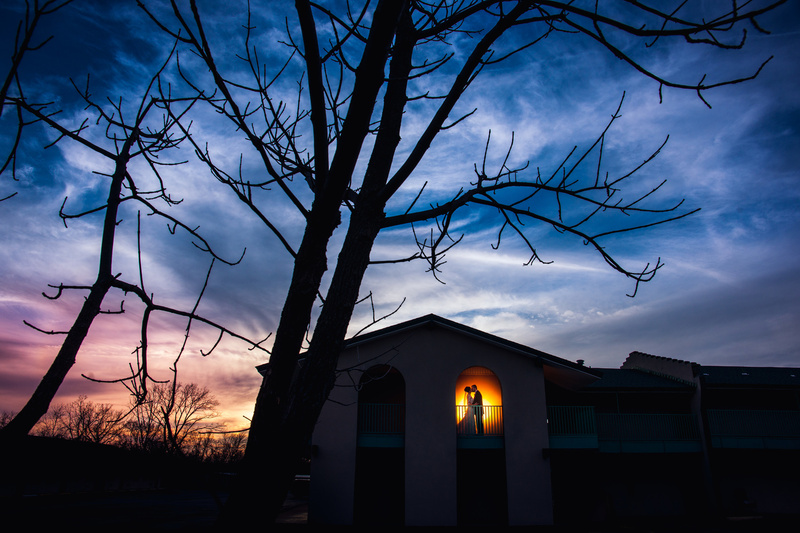 The below image was taken at f/1.8 (on accident, since there was plenty of light to stop down) but since I was shooting at 20mm the couple and building are all still in focus. Considering my surroundings, I also couldn't back up any further without stepping into traffic, so the 20mm lens was the only way for me to have the entire building in the frame. That’s not to say you can’t capture a few shallow depth of field effects to help isolate your subject. In this next image, the foreground detail was significantly closer than my subject so I was still able to have that detail become a pleasant out-of-focus blur that draws your eye into the frame where the couple is standing. When you stop down to around f/5.6, it makes the lens perfect for run-and-gun shooting where it can be difficult to keep up with your subject. 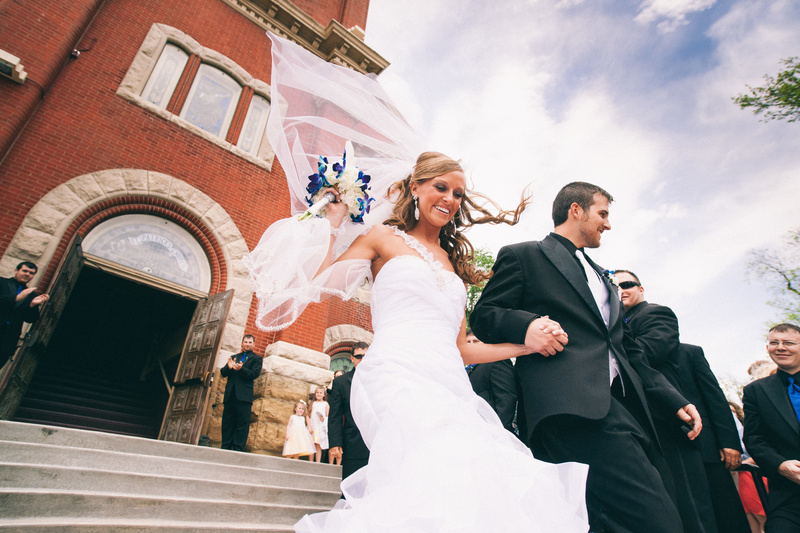 In this image below, I was running alongside the couple as they were leaving the church. I could conveniently frame my shot, start shooting, and not have to worry too much about focusing on the couple as they ran toward me. Mind you, this was me shooting and running backward down the stairs, not something I always recommend. 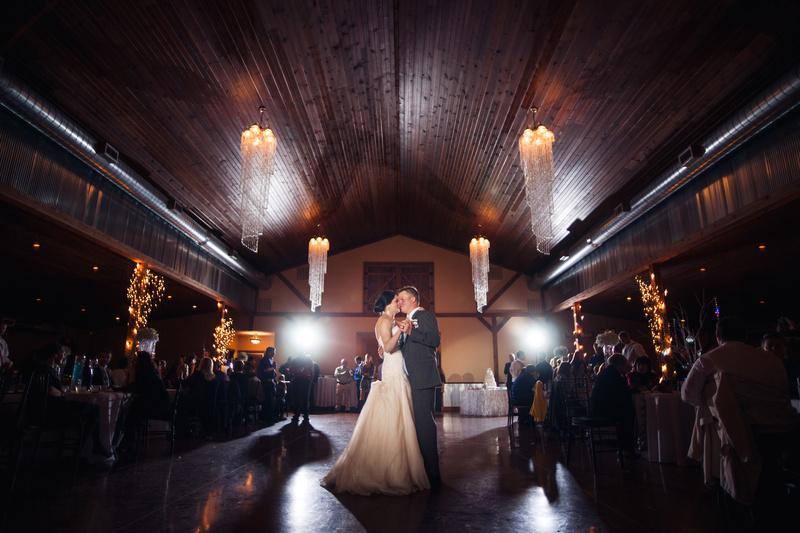 Once we arrive at the reception location, I usually have my 20mm lens glued to one camera body. Shooting wide allows me capture a good overall shot of the venue. Then, from that point I use light to draw the viewer's eye to the subject. One of my favorite parts of the day is when the traditional first-dances have ended, and the party dancing begins. 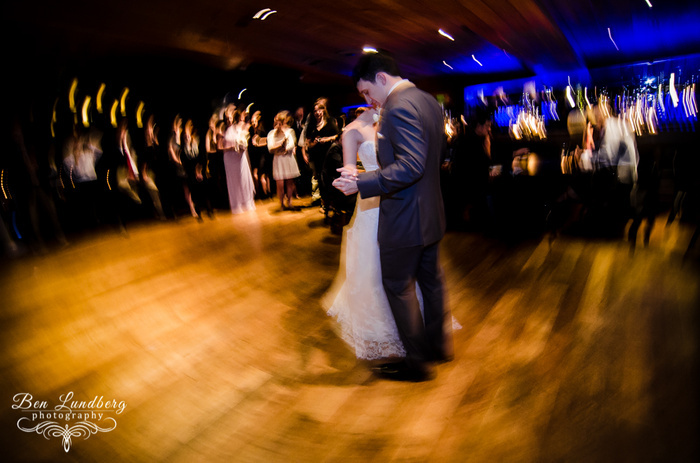 Originally, when I first started shooting weddings, I would hover around the outside of the dance floor. When I began shooting with the 20mm lens, I found that it required me to get up and in the action. This can be a little awkward at times, but once you jump in there, you tend to receive more interaction from guests and they start to loosen up and show off for you. Although I try to crop most of my images in-camera, when shooting super wide it can sometimes be hard to get close enough to the action. Other times, you only have a split second to catch a special moment before it's gone, so you don't have time to move closer. In instances like this I have no issue cropping a photo in post to tighten up my frame. The thing to keep in mind when shooting with a 20mm lens, or any other wide-angle lens, is the effect it can have on people’s faces. The closer your subject is to the edges of the frame and the closer your subject is to the camera, the more this distortion can affect your image. That is why I only use my 20mm lens for full body portraits. For more information about how distortion affects the face, check out this great article on how a lens' focal length shapes the face. Another distortion to keep in mind is perspective distortion. This can be seen in the image above with the large building. Since I’m fairly close to the building, I have to tilt my camera up to get the entire building in the frame. By utilizing this technique with a wide-angle lens, it can seem that the edges of the building are falling in toward the center of the frame. I don’t think it’s necessarily a bad thing, but it is something to be mindful of. This can be fixed in post, to an extent, but when you have subjects in the image, they may end up looking stretched or misshapen if you’re not careful. Because of this, I try to keep my subjects a decent distance away from the camera, as well as in the center of the frame, to help minimize this distortion from affecting them. What do you think? Do you have a wide-angle lens as part of your kit? How do you like to use your wide-angle lenses? 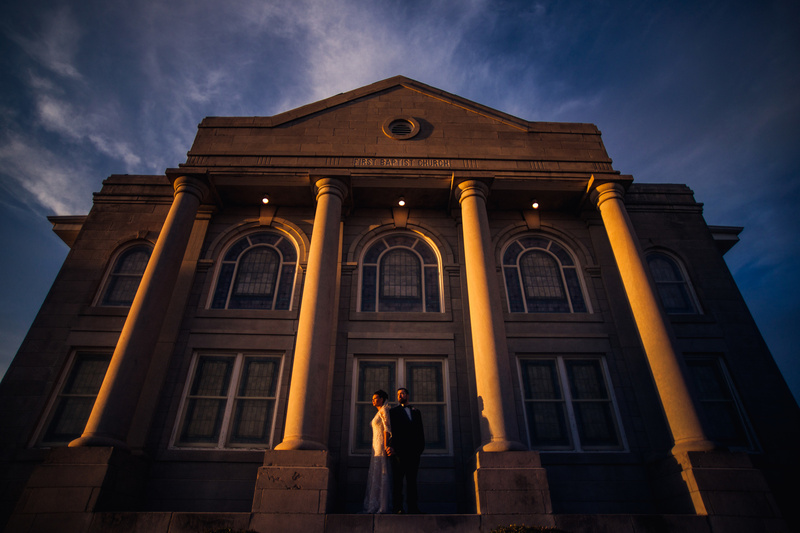 Although I don't do weddings, a 20mm has been in my arsenal for decades. Superwides are an important part of my shooting. I've been eying the 14mm Samyang as well. what do you use your super wide lenses for? All sorts of things, actually. I used to shoot a lot of concerts, and superwides can grab in the entire atmosphere of the moment. Cityscapes and architecture are another. My trusty old 20mm f/4 Ai Nikkor which I've used for over 35 years now is an accurate rectilinear lens, unlike most modern wides which exhibit annoying amounts of barrel distortion. It's great for architecture. I'm in the process of setting a virtual walkthrough for a client's website, and I'll be using the 20mm to create Quicktime VRs. I also have a product shoot coming up (small items) and I may consider the 20 for a shot or two. With strobes you have to make sure you're getting enough spread if they're going to be the main light source. Do you ever find yourself needing more strobes for a given situation? Not really... for the dancing type images I usually just have an on camera direct flash and i have it zoomed to about 70mm because I like the spotlight effect and I want to only freeze the action of my subject and let the edges streak as I move my camera. For images with off camera flash I really just need to light the subject so the spread I need is the same for any lens. Awesome piece. How did you light the bridge shots? Thank you!! I used an Einstein strobe in a large Octa with the grid. The light is taken out in post for the 85mm shot and the light is out the of the frame for the 20mm shot. great read. 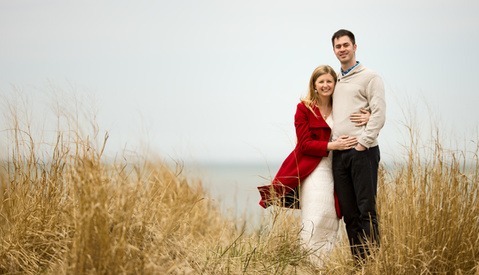 My personal goal for wedding work is to work more with my 24mm for portraits. I tend to lock in on 85 or 135 and not show enough of a scene unless my subjects are far away. I use a super wide (Tokina 11-16 f2.8) for street photos. I love the angles it gives you. It also allows you to crop pieces of the image after correcting for distortion. 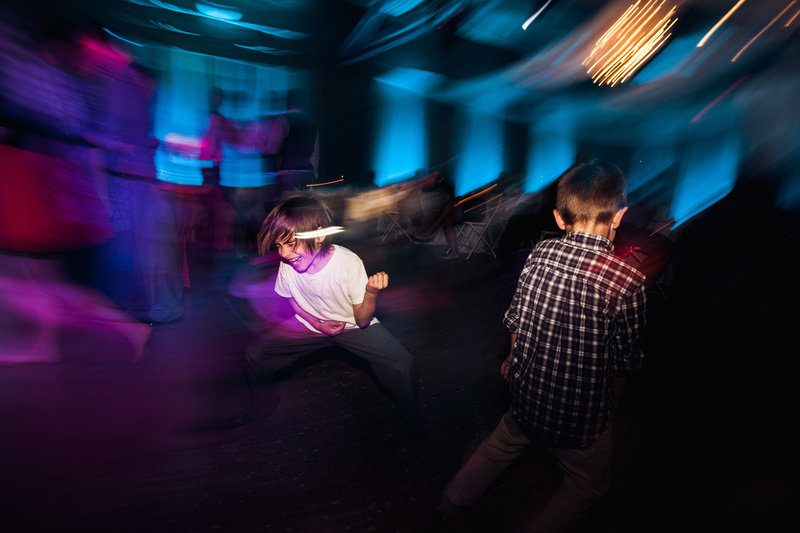 I've been trying to figure out how to take images similar to that last one of the boy playing the air guitar. Not sure what the technique is called. Any help? its called "dragging the shutter". I use the flash to freeze the motion of the subject and the shutter is open for around 1/10th of a second to let the ambient light burn in. To get the streaks I just move my camera around after the flash pops and while the shutter is still open. I mention Nikon b/c with Canon you cant rear curtain sync with off camera flashes, unless you use canon's POS system.....with Nikon, you just tell the camera to do it, and it does. rear curtain sync is pointless for these types of shots and just makes the job alot harder. If someone is facing left with his back to the right and you want his shadow behind him you just move the camera to the left after the flash has fired. Rear sync is for when the camera is mounted on a tripod and the subject is moving. I disagree Jonas. Rear curtain sync is perfect for these types of shots. 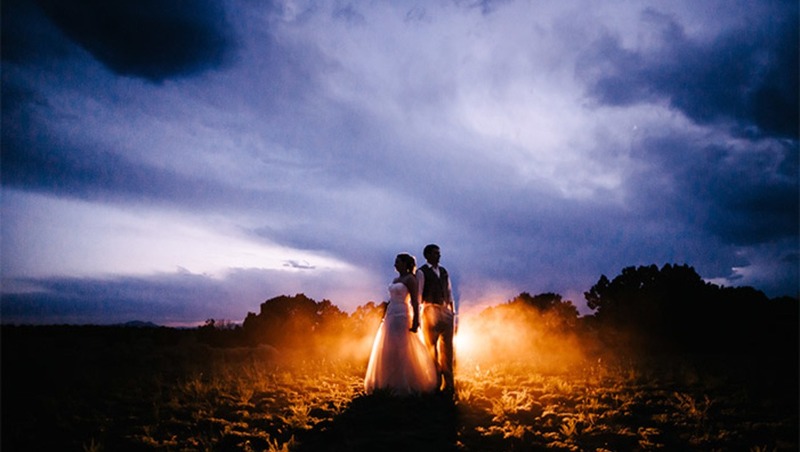 With a slow shutter speed, you want your flash to pop and light your subject at the END of the exposure. You don't have to even THINK about which direction your camera is moving. I see what you're saying. I use rear curtain all the time in nightclubs when dragging the shutter, so perhaps I'm just set in my ways. Cheers! 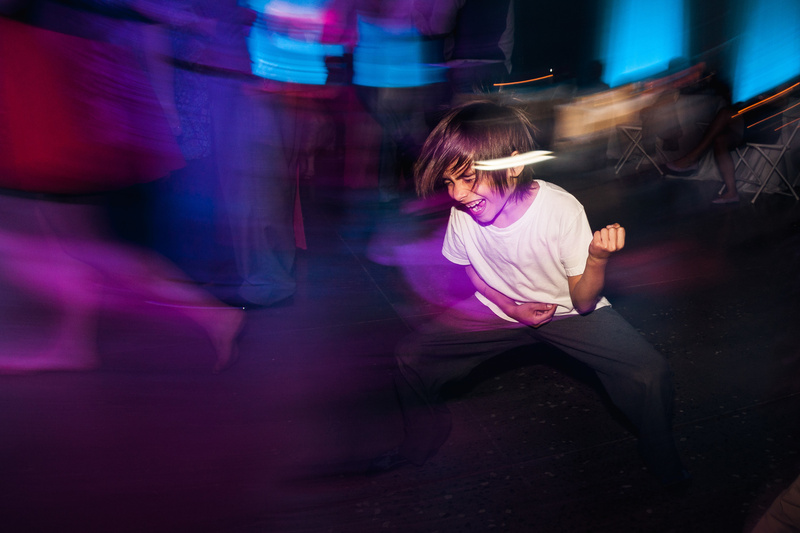 I really like the shutter drag you got here of the boy playing the air guitar. Again this is a technique I have tried before, but only a few times with very limited success. I tried the rotating the camera through the exposure and got some OK to really bad results. The one I have posted here was done at 1/10th of a second as well. It looks like you are just letting in a bit to much ambient light. You need to keep around 1/10 shutterspeed so you either need to lower your ISO or raise your fstop. Thanks for the tips and I agree there is too much ambient. I keep my fuji 10-24 glued on one of my xt1's during receptions. I love the wide and crazy distortion it can cause. I also don't mind cropping in Lightroom afterwards. Great article. The wide angle shots published here are impressive. The problem with wide angle images as I see it is viewing distance. Are really large prints being sold and displayed ? increasingly, pictures are viewed on electronic devices like the smartphone I used to see them. Even on a computer or IPad screen the images will appear quite small. In recent years my shots have become tighter and more simple for a variety of clients for that reason. Where do people view large images or large prints ? Thanks Rex! I try and get at least a couple of these dramatic style images at each shoot. They usually end up as a large print in a living room or a full spread in an album. Totally agree that a small cell phone screen doesn't do these types of images any justice but I think the general point of them still comes across. glad they were helpful for you!! Beautiful images, Jason. May I ask what 20mm lens you are using? nice shots! Really like the one on the steps! Think it would be cool to have gotten a bit lower on the bridge shot in order to gets some more of that cool reflection in the pool! As for brand, I don't think you can go wrong with either Sigma or Nikon. all the images above are with the Sigma from when i shot with Sony. But just recently I moved to NIkon and the Nikon 20mm is great as well. If i had to pick i would go with the Nikon since it seems to be a bit sharper all around and a bit faster AF. Thanks for the feedback. The pool cascaded down so I think I was not very high off the ground where I shot this. Although I cannot remember for sure, I just remember I was standing in an "off limits" decorative fountain or something similar at the time. :) Have you or anyone you know used the website "borrowlenses.com"? I may try renting the Nikon 20mm for a few days and see how I like it.